Get tips on the design and creation of stone patios using concrete, texture mats, and color. Professional designer, Scott Cohen, shares his design experience on a beautiful job. Medusa of ancient Greek mythology was said to have eyes that could turn anything into stone. 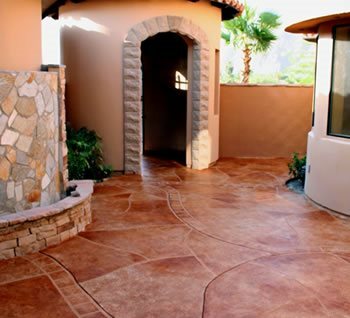 Today, it’s possible for contractors to cast a similar spell, transforming ordinary concrete patios into natural stone of all types, using techniques such as hand carving, stamps, and texturing skins. Using concrete as a replacement for a traditional stone patio is not only cost effective, it also eliminates some of stone’s inherent drawbacks. Laying a stone patio can be a labor-intensive process, since each piece must be placed individually. 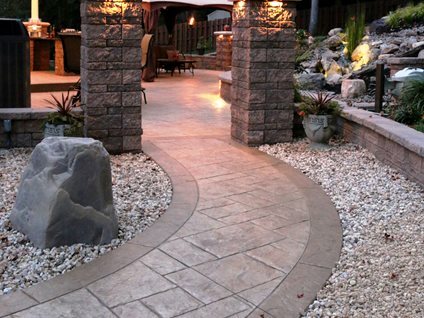 With concrete, the entire patio can be poured in one step and then stamped or scored with a stone-like pattern. 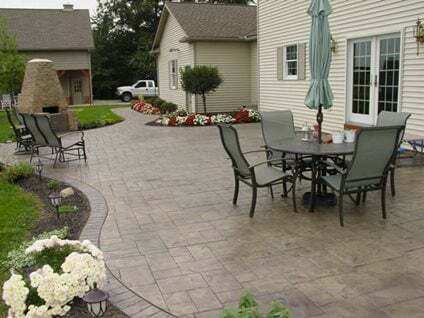 Not only is installation simpler, concrete patios are also easier to maintain than natural stone, since you don’t have to worry about weeds sprouting up between joints or about pieces becoming loose or cracked. Concrete patios that mimic stone or slate can be poured new, or you can resurface an existing concrete slab with a stampable overlay. Many manufacturers have made stamps that perfectly replicate slate, flagstone, cobblestone, and more. 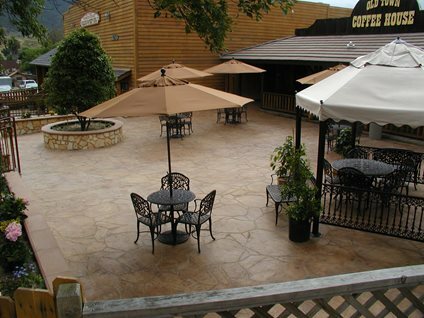 Because of its versatility, nearly all types of stone patios can be recreated using concrete. 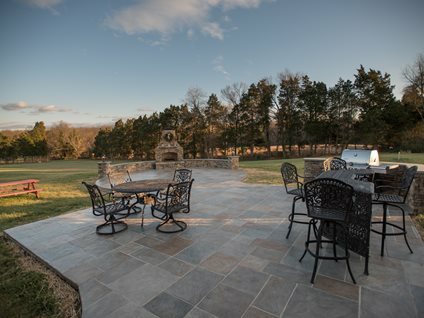 Slate and flagstone are the most popular concrete patio patterns, but other attractive options include travertine, random-cut fieldstone and European cobblestone. 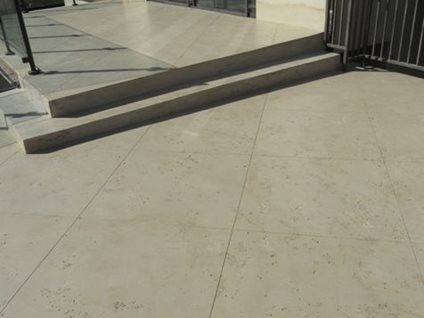 Or you can simply replicate the texture of stone using special texturing skins that have indistinct pattern lines. To reproduce the natural color variations of stone, you can choose from a wide variety of coloring options including stains, dry-shake color hardeners, antiquing agents, and integral colors. Often using a combination of colors or coloring methods will produce the most realistic results. 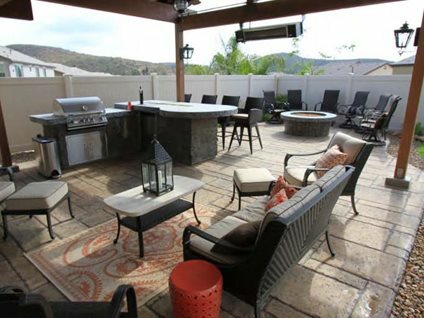 The 900-square-foot stamped concrete patio was designed to have a separate eating area and separate sitting area near the fireplace to accommodate guests. Salzano used a traditional ashlar slate pattern, and replicated bluestone’s natural color variations using a custom-blended color hardener mix. For this beautiful 1,200-square-foot patio and outdoor entertaining area, travertine stamps and stone-textured form liners were used to replicate real travertine, creating a high-end look for a reasonable cost. These homeowners wanted the look of a natural slate patio, but didn't want to pay the high price. They were able to achieve the same upscale appearance for about half the cost using concrete. The look was created using an Old English Slate pattern and variegated color accents to replicate those found in natural slate. Even the faux grout lines, colored a tan shade, look authentic. These homeowners wanted to replace a failing stone balcony with something that would match their limestone pool deck below. The solution was to use a lightweight cement-based overlay integrally colored a light cream shade to look like natural limestone. Diamond tools were then used to hand cut a linear pattern in the overlay to mimic cut stone. This stunning patio was created by applying a cement-based overlay to existing concrete, using a trowel to achieve a stonelike texture. The overlay was then sawcut into organic shapes to mimic natural hand-laid stone. To create the rich colors and faux grout lines, the concrete was hand colored in three different shades of water-based stain. Tape was used as a stencil for the grout lines. Why stop the stone effect at the patio? 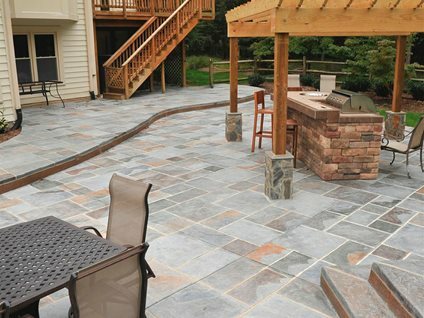 This outdoor living space features faux stone throughout, creating a cohesive look that extends to various outdoor “rooms.” It includes two separate stamped concrete patios connected by a stamped walkway, all featuring the same ashlar slate pattern. In addition, the columns and retaining walls were built with stone-look concrete pavers. Here are three small patios (around 1,000 square feet or less) that mimic natural stone yet have very distinct looks through the use of different shapes, patterns, and coloring techniques. They also are very budget friendly, averaging about $10 per square foot. Surrounding a faux stone concrete patio with a border in a contrasting pattern is an effective way to create more drama and impact. Get this look using an ashlar slate pattern for the main patio and a brick pattern for the border. 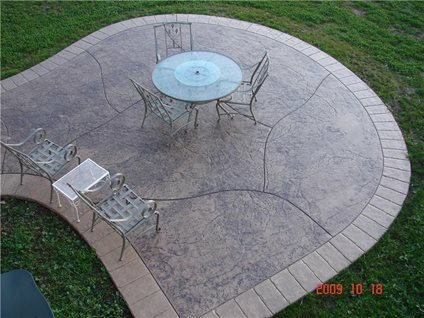 Overlays stamped with a stone pattern are a great solution for existing concrete patios. Thicker-build overlays (1/4 inch or greater) work well for these applications and can be used with most stamp patterns and texturing skins.